Avon’s youth-oriented Mark brand has launched Saint Barts Soleil, the latest in their Instant Vacation series of fragrances for women (the last was Marrakesh). Saint Barts Soleil is fronted by actress and singer Lucy Hale. A luxurious blend of fresh, breezy Caribbean waters; rich, exotic coconut milk and bold, beautiful frangipani flower takes your senses on a journey to a glam island resort. 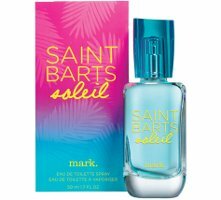 Mark Saint Barts Soleil is available in 50 ml Eau de Toilette, and is part of a larger Saint Barts Instant Vacation fashion, jewelry and beauty collection.